Former Minister of Environment Kim Eun-kyung is to be questioned by the court in an arrest warrant hearing Monday. Kim faces allegations of pressuring heads of public organizations under the Ministry of Environment to step down to make room for individuals with ties to the Moon Jae-in administration. The request for the warrant was filed by the Seoul Eastern District Prosecutors’ Office on Friday. She faces charges of abuse of authority and interference with others’ exercise of their rights. If approved, Kim will be the first former or incumbent minister-level official of the Moon Jae-in administration to be arrested. In addition, observers say that should the court issue the warrant, the probe is likely to expand further, raising more questions about the Moon administration’s personnel management, which has been targeted by the opposition on a number of occasions. Kim, who led the ministry from July 2017 to November 2018, reportedly denies the allegations. 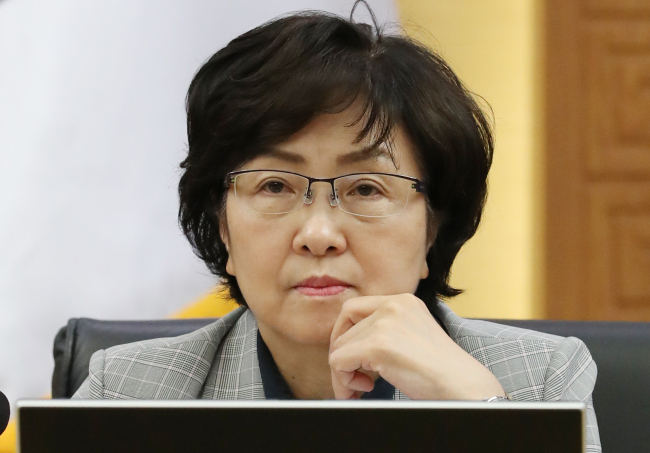 The main opposition Liberty Korea Party has raised the suspicion that her ministry had listed high-level officials of ministry-affiliated entities to apparently pressure them to leave office. The investigators believe that Kim drew up a “blacklist” of individuals appointed during the previous Park Geun-hye administration and personally pressured them to resign. Investigators are said to have secured accounts detailing such activities from working-level Environment Ministry officials. In the probe, the prosecution is also said to have secured evidence suggesting Kim played a role in the appointment of pro-Moon administration figures. The allegations surrounding Kim came to light last year, voiced by Kim Tae-woo, a former member of Cheong Wa Dae’s inspection team. Inspector Kim claimed that while he was on the team, he reported related developments to his superiors but his report was ignored. He also claimed that his reports concerning a number of figures with close ties to the administration were ignored and he was penalized for looking into such individuals. On Friday, Cheong Wa Dae said it expects a “balanced” court decision on the request for the warrant. “We will watch the court judgment on the extent of a minister’s authority for personnel management and oversight authority,” Kim Eui-kyeom, the presidential spokesman, said in a text message sent to reporters.